This new paste has replaced our push up sticks. It is the same recycled paper packaging but is now a larger size and much creamier and easier to apply. Comes with an applicator for no fuss and no mess. This ladies deodorant is a semi solid paste packaged in 100% post consumer paper. It is developed and formulated specifically to suit our harsh climate using the power of organic coconut oil, bees wax (from a bee keeper who operates a sustainable apiary), and shea butter. 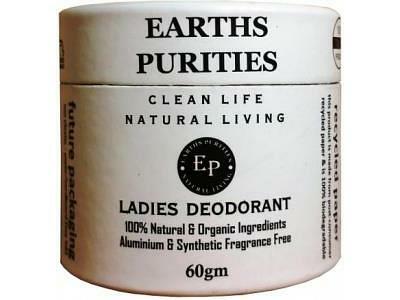 Also used is food grade Australian bentonite clay and diatomaceous earth which assist in magnetically de-toxing the armpit by drawing out toxins and heavy metals. A small quantity of aluminium free bicarbonate soda is used to minimise odour and arrow root to help keep the area dry by absorbing sweat. Ingredients: *Organic coconut oil, *organic shea butter, organic arrowroot, organic beeswax, aluminium free bicarbonate soda, organic carnauba wax, diatomaceous earth, organic bentonite clay, lemon myrtle essential oil, tangerine essential oil, Peru balsam essential, lavender essential oil & natural vitamin E oil *Certified Organic.